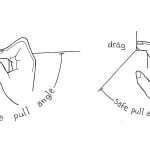 In real-life climbing you tend to hop from hold to hold using momentum, rather than holding lock-offs or deadhanging for long durations. Ola Przybysz demonstrates proper movement on Round Table Conference (5.12d), The Egg Mountain, Yangshuo, China. Photo: Chuang Liu (Karma Productions). A popular definition of insanity is to repeat the same mistakes and expect different results. 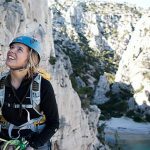 On the whole, training for climbing is evolving, and methods are increasingly safe and effective. However, as a coach I have recently been concerned to see certain primitive methods re-emerge. When I started climbing in the mid 1980s, training methods were crude—barbaric, even. Injuries were accepted as par for the course, and most of the top climbers from the era at some point went under the surgeon’s knife. Today, an overwhelming body of evidence, both in research and anecdotal form, suggests that certain training methods need to be red flagged. 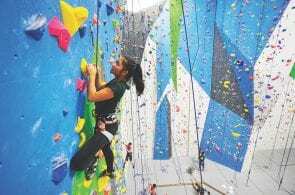 We’ve hit the point where so many people are getting into climbing at gyms, and there is so much training information online, that it’s difficult to discern right from wrong. What follows are outdated training methods that are cropping up again, and suggestions for more effective alternatives. Don’t deadhang (at any angle) for more than 15 seconds. Long-duration hangs are less specific than short ones to the rhythm and cadence of climbing. 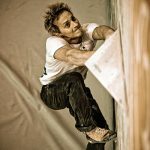 In other words, if you’re deadhanging for longer than 10 to 15 seconds when sport climbing or bouldering, it’s your technique, not your strength, you should work on! Additionally, anecdotal evidence suggests that long-duration isometric contractions may be more likely than shorter ones to cause repetitive-strain injuries, especially if performed with high loads and to failure. You are likely to get better strength gains and may be less likely to be hurt if you keep contraction times between three and 12 seconds as opposed to longer. For endurance, it’s better to hang intermittently, as opposed to at length, using a “repeater” structure. For example, hang either for seven seconds on, then three seconds off, or six seconds on and four seconds off, with the length of the work periods subject to your training requirements. For “short endurance” (anaerobic power/capacity) cycles, hang for one to two minutes, and for long endurance (aerobic power), hang for four to six minutes. I thought this one had disappeared, but sure enough, it’s back, too. 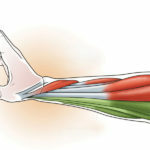 In the 1980s and early 1990s many climbers used to warm up with stretches for the forearms, shoulders and lats, but research, which is now two decades old, concludes that this may do more harm than good. A static stretch simply involves taking up the tension in the muscle and holding it still. If you stretch a muscle statically before exercise, it may become over-relaxed and weakened; worse, static stretches may actually increase the likelihood of injury by dulling the reflex receptors. Instead, replace static stretches with dynamic-mobility exercises such as arm swings, hip circles, spinal twists and leg swings. It’s O.K. to include a few static stretches for the legs in the warm-up since you’re less likely to injure your legs than your torso when climbing. 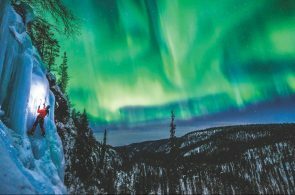 However, avoid stretching the hamstrings statically before bouldering, which may involve aggressive heel hooks, and instead do a dynamic hamstring stretch. An example here is to stand up straight, grasp one foot with the same hand, move your leg out to the side, attempting to straighten both legs, and then return to the starting position. Alternatively, simply do leg swings to the front and side. Strength-and-conditioning training may be all the rage at the moment, and while there are many good supportive exercises, I really don’t understand why squats are back! When my dad and I started out in the mid 1980s, there were no books, magazine articles or online resources on training, so, like most other climbers, we made it up as we went along. One of the worst ideas we came up with was heavy barbell squats and bent-legged deadlifts to build leg strength for rock-overs. Climbing is surely the most power-to-weight-oriented sport ever conceived, and the main requirement is to pull ourselves up using the small, fragile tendons in our fingers. The glutes and quads are the biggest muscles in the body, so I feel the potential losses from this sort of exercise outweigh the gains. Few of the best climbers have bulky leg muscles. Muscle bulk is difficult to lose, so be cautious in jumping on board with the current trend of climbers training their legs with weights. I suggest straight-legged deadlifting (in which you hold a bar with an overhand grip and stand with a straight torso, feet shoulder-width apart, and knees slightly bent) as an alternative for building overall body strength and power, and that you minimize strength exercises involving bending the legs. If you want to get good at slabs, simply practice them. Another outdated training practice that has re-surfaced is the concept of training strength or endurance exclusively in dedicated phases. Of course, if you focus purely on strength, you make the best gains, but the down side is a simultaneous loss in endurance and then having to catch up. 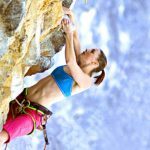 Most climbers and coaches now favor “prioritized” phasing, a key principle of periodized training. The aim is to focus mainly on strength during strength phases while keeping endurance topped up. An example would be to train strength three times a week and endurance once. You can then switch the priority around in the following phase, and prioritize endurance while keeping strength up. Phases typically last between three and six weeks, subject to the overall length of your program. Of course, many variations are possible, but the take-home message is to avoid spending long periods of time away from certain types of training. 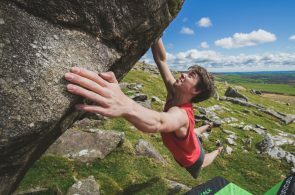 Neil Gresham of Sheffield, England, is a professional climbing coach, runs the training website neilgresham.com, and is an all-around climber who has done 8c+/9a, 5.14x trad and WI 7, and put up new routes from Brazil to Mongolia, Vietnam, Iceland and China.